Yes, I know it isn't September yet, but I like to be ahead. Tomorrow is our official teacher work day and then students arrive Tuesday at 8:15- all 32 of them. I have 16 boys and 16 girls and of those 32 little darlings- 12 YES 12 of them will still be 4 years old. So, because I like to be ahead- here is the September calendar I will be using. WOW. 32?! And I think 22 is too many! Do you have any additional help in your room? Thanks for the calendar, I think I'll be using it with my kiddos! Do you plan on adding each month as you go along? LeAnne Yes, i hope to add the hoers soon. As for the help, maybe some parent help and ELD push in a few times a week. Sometimes we get college kids needing hours before they apply to the credential program. Oh my goodness. 32?????? And no aide??? I am so very lucky!!! Hope you have a good year! Our cut off is Dec. @. NExt year November, then it will roll the following year to October. I will not complain about my class of 27! Bless your heart!!! You sound like you have a good handle on it though! Best of luck with your new school year! Best of luck this year! I can't imagine 32 kiddos! 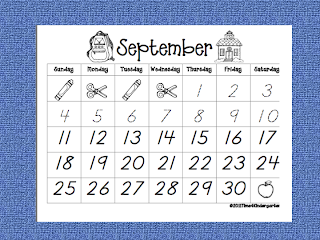 Thanks for posting your September calendar! Love your blog! I just read your profile and see you teach in No Cal. I too am in NoCal, Sacramento area. Wondering which area you are from? Have a great school year!